Well Summer has officially started! The boys are out of school, Nick graduated and the fun has begun! 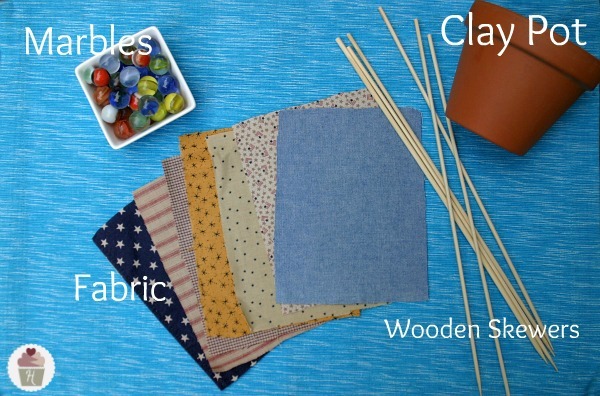 Last week I gave you a little sneak peak at the Summer Mantel and shared how to make Paper Fireworks. I’m back with the big reveal! 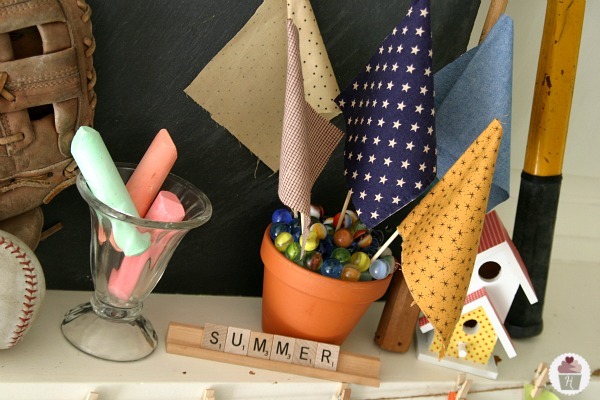 When I first started thinking about decorating the Summer Mantel, I decided to pull in several different fun activities that shout Summer Family Fun! 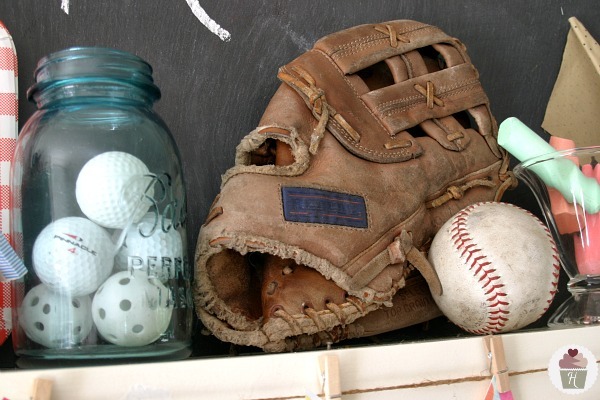 Baseball…Picnics…Fireworks…Ice Cream and Sidewalk Chalk…just a few of our favorite things about Summer! And a Pinwheel Garland to add even more whimsy! While shopping at my favorite thrift store, Goodwill, a couple weeks ago, I spotted a metal Barbecue Set. I love the nostalgic feel with the red and white checker mitts. I added some marshmallow skewers to enjoy our S’More Buffet and the silverware stuffed in a blue jean pocket left from the Memorial Day Party. Some favorite red and white checker plates and an Aqua Mason Jar filled with golf and small balls. 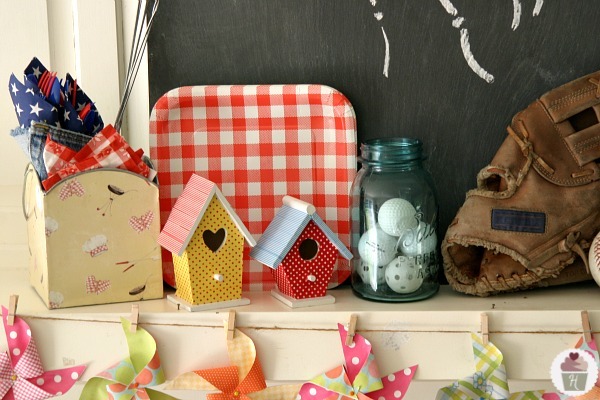 And we can’t forget the Washi Tape Birdhouses…fun! 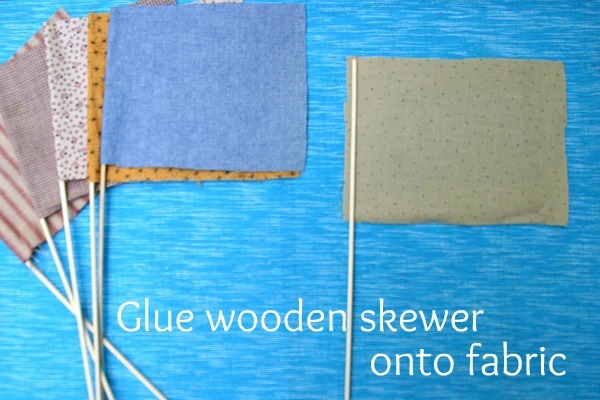 Learn how easy they are to make! Baseball is a large part of our Summer! I found Doug’s old mitt tucked away in the garage. And finishing out the Summer Mantel, an ice cream sundae glass filled with sidewalk chalk, some homemade flags in a clay pot filled with old marbles, Scrabble Tile letters to bring in our love of games and another Washi Tape Birdhouse. Hi – I’m visiting from Layla’s summer mantel link party! This is my first visit to your blog, but won’t be my last – it appears that you live in LaPorte, Indiana? Before I moved to Texas three years ago, I lived in Long Beach in Michigan City, and my first job in the United States (I’m originally from Australia), was at a bank in LaPorte, so I know the area well! Anyway, your mantel is lovely – I love the birdhouses and the pinwheels – they are just darling! 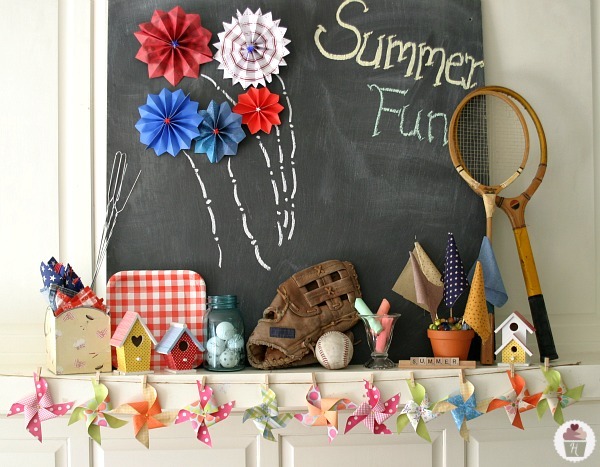 Must make this pinwheel garland! Love, love, love your mantle – it just screams SUMMER !!!! You’ve inspired me to re-do mine in my rarely entered living room – maybe it’s time to spread out ! 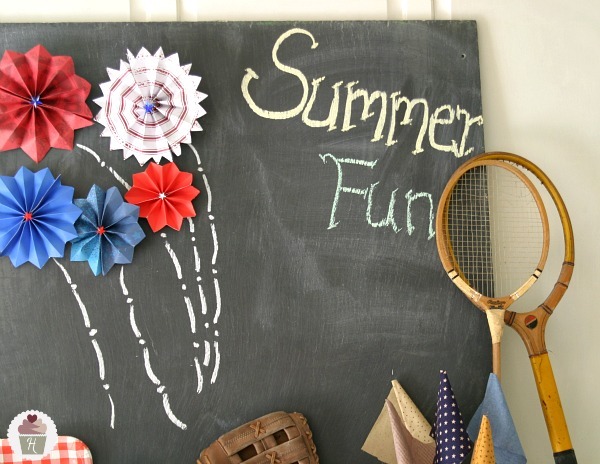 ahhhh summer fun all in one spot – great job! What a cute mantel! I especially love your pinwheel garland. Fun! Your mantel is the epitome of summer!! I love the pinwheel garland idea. So cute! Hi Liz. Awesome decorations! And yes, this definitely shouts “Summer Family Fun”. 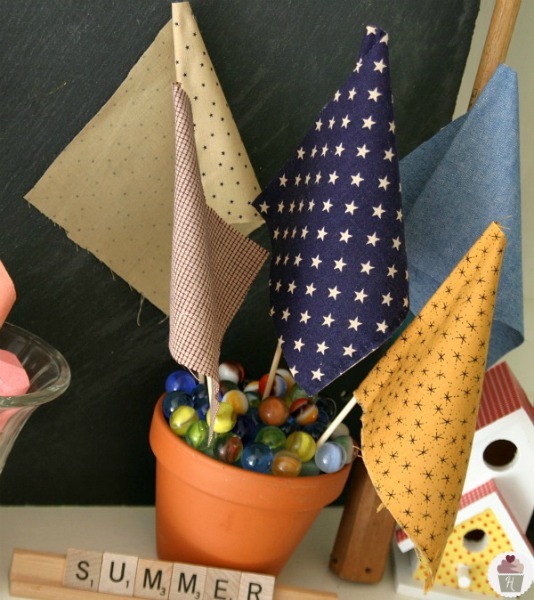 Thank you for sharing the steps on how to create these rustic flags. Wow! If your house is in the market, for example, creating a fun and well-presented house is important, and this idea is really great. Will have to try this soon! 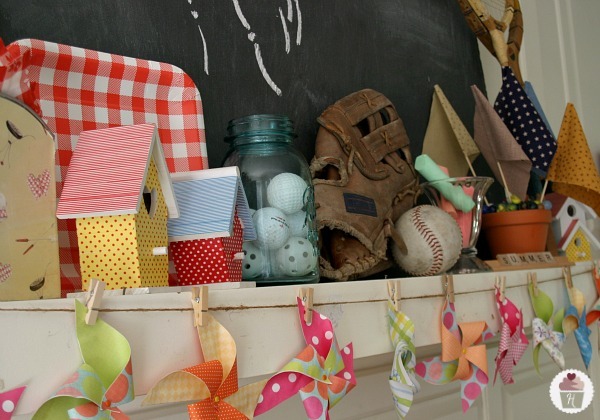 What a fun summer mantle! I love the fireworks! I love how you used the pinwheels. I have some left over from teaching a group of children at church how to make them. Now I know what to do with them. Your mantel is beautiful and so original. It feels real and authentic, it seems to really suit your family. The flags in the pot with marbles is a fantastic idea. I would like to decorate our sideboard and I am struggling … I think I might borrow some of your ideas. Thanks for the inspiration! It’s all so cute, but I especially love the “fireworks” on the chalkboard! Oh I love the mantel idea! 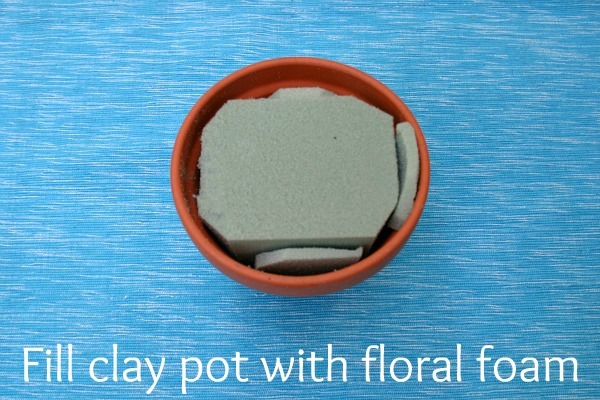 Going to try that soon! Thanks so much Raquel! The mantel is one of my favorites so far.